For a team that hadn't played in the Class 6A state tournament in six years, the West Linn girls basketball team looked right at home on Wednesday. 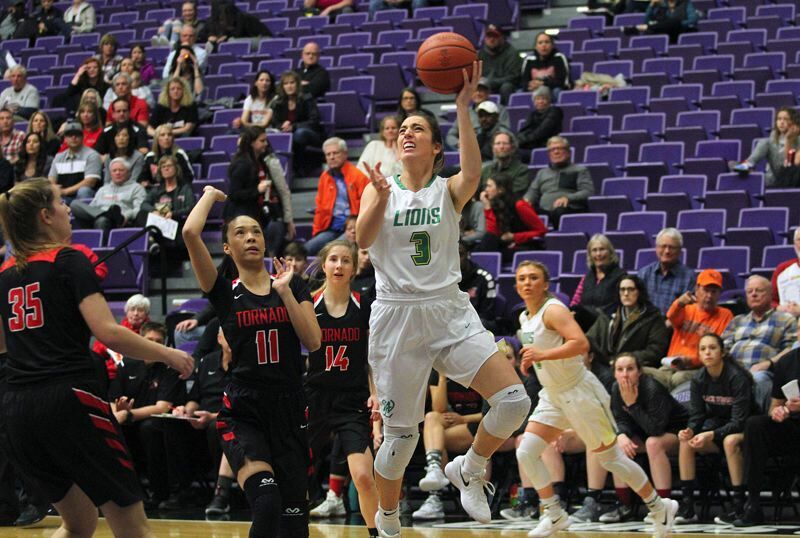 To be fair, the Lions led North Medford by just three points early in the third quarter of their quarterfinal contest, but after that, West Linn took off on a 9-0 run that boosted its lead to 12 points and set the stage for its 42-32 victory at the Chiles Center on the University of Portland campus. "I think we were all a little bit shaky in the first quarter, but once we got the nerves out, I think we just played our game and we did really well," said West Linn senior guard Brooke Landis, who knocked down two fourth-quarter 3-pointers to keep the Black Tornado at bay. "It's like we're all freshmen at this point," added West Linn senior guard Lexie Pritchard, who added eight points, five rebounds, two assists and a steal in the win. "None of us have ever made it to the Chiles Center before, and I think in the first quarter, we could see that we were a little nervous. It was just getting a feel for the game. It's a college court, a different atmosphere, but I feel like we brought it and worked really well together and made things happen. And we made adjustments and that's how you win games." West Linn freshman post Aaronette Vonleh — recently named with Pritchard to the all-Three Rivers League first team — showed some nerves of her own early on and missed her first two shots. But after that, she hit six of her final eight and finished with 13 points, nine rebounds and six blocks. "Definitely (there were nerves). It was like a new environment," Vonleh said. "We just needed to get into a rhythm and focus on the game and the stuff happening around us." With the win — fourth-ranked TRL runner-up West Linn's eighth straight — the Lions improved to 23-3 overall and advanced to meet top-ranked Metro League champion Southridge (25-1 overall) in the state semifinals at 1:30 p.m. Friday. Southridge beat No. 9 Clackamas 57-42 in its Wednesday quarterfinal. Needless to say, the Lions are looking forward to the challenge — and the opportunity — of playing against the defending state champions. The Skyhawks enter Friday's game as winners of 23 straight contests. "Southridge is incredible. Everyone knows Southridge is a great team," Pritchard said. "I'm really excited. I love playing teams like this and I think we are one of the best matchups for them. I'm ready to see (Vonleh) go up against (Southridge sophomore Cameron Brink), one of the great players on the west coast, in the country. I'm really excited to see us go up against them and it will be a great game." "We're just going to have to play hard and keep doing what we're doing," Vonleh added. Fifth-ranked North Medford — the Southwest Conference champion — had come in as winners of 12 of their past 13 games, but fell to 18-8 with the loss. The Black Tornado will face Clackamas next in the consolation semifinals at 9 a.m. Thursday. Neither team was sharp offensively at the start of Wednesday's game, with the Lions hitting just 3 of 11 shots in the first quarter — their efforts highlighted by a Pritchard three-point play — and turning the ball over five times, while the Black Tornado made just 2 of 11 shots and committed four turnovers while falling behind 7-4. The pace quickened in the second quarter, with Vonleh hitting twice from the floor and Pritchard adding five points for the Lions (including a "three"). Eventually, they forged an 18-13 halftime edge when freshman Makayla Long hit a jumpshot with 1 minute, 50 seconds remaining in the half. For North Medford — which was led by senior post Megan Fossen's 19 points and 14 rebounds — Fossen got her game in gear by hitting 3 of 7 shots from the floor and adding three foul shots to rack up nine points in the frame and keep her team close. The Black Tornado then edged even closer when Fossen rebounded her own miss and scored to cut West Linn's lead to 18-15 just 16 seconds into the third quarter. But it was there that the Lions responded with their best stretch of the game, taking off on a 9-0 run over a span of four minutes that boosted their lead to 27-15 and set the stage for their eventual win. West Linn senior Kennedi Byram started that sequence with a pair of foul shots, and two possessions later, Byram took a Pritchard pass and scored on a backdoor cut on the left side to give her team a 22-15 lead. West Linn forced a miss by Tornado junior Talia Baker on North Medford's next possession that was rebounded by Long; she sent an outlet pass to Pritchard, Pritchard threw long to Byram and Byram dumped it to the sprinting Vonleh for a layin on the right side. Freshman guard Cami Fulcher added the final piece to that streak when she drove the lane two possessions later, took a hit from North Medford senior Adriane McLemore and scored to push her team's lead to 11 with 3:05 left in the quarter. Fulcher was also awarded a free throw and completed the three-point play to give her team a 27-15 lead. The Black Tornado tried to come back in the final period, but West Linn was having none of it, with Landis hitting two 3-pointers in just 1:28, Vonleh tacking on five more points and West Linn putting the game away at the foul line. Afterward, the Lions said that defense was the key to their success. They held the Black Tornado to 24 percent shooting from the field and blocked 12 North Medford shots. "Overall, we played really good team defense and a team game and I think that helped us a lot," Landis said. "We knew they didn't shoot extremely well (from the outside) so we let them have room for that, and then we ran the court really well … used our strengths and took care of business." "We always stress defense. Defense is always our number one priority," Pritchard said. "That's our main focus because defense wins games. Our coaches prepared us really well for the game. They told us who the matchups were going to be and we executed and that's how you're going to win games." Byram added eight points in the win for West Linn, along with two assists and two blocks, and Long had two points, four rebounds and four blocks. After Fossen's 19 points (on 8 of 25 shooting), sophomore Jane Ersepke added seven for North Medford.